Your iPad is pretty easy to use. But, as with most things, there are certain tricks that help you get the most out of your device. Keep reading to discover ten great hints, tips, and shortcuts. 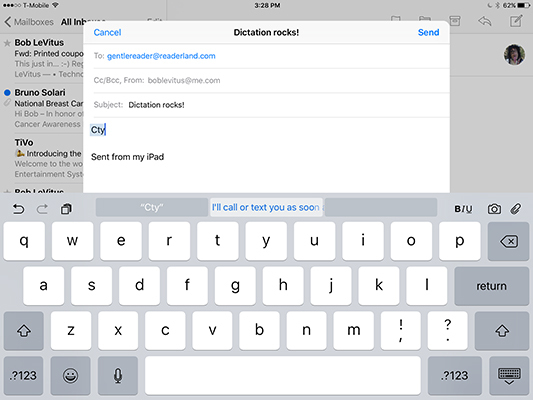 Keyboard shortcuts are a way to have your iPad automatically type a phrase when you type the shortcut. For example, if you type vty followed by the spacebar, your iPad will type Very truly yours. Type a 3-letter shortcut, and your iPads replaces it with a 14-letter phrase in the blink of an eye. Here are some more examples. 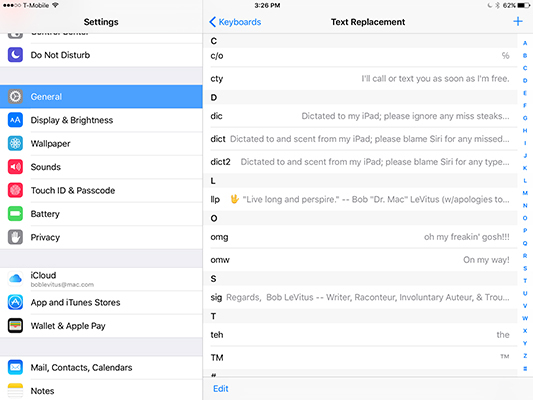 How long would it take you to type Dictated to and scent from my iPad; please blame Siri for any missed type ohs on your iPad’s on-screen keyboard? And would you type it without mistakes? It took a fraction of a second to type a shortcut for this phrase (dict), and another fraction of a second for the iPad to expand it (to Dictated to and scent from my iPad; please blame Siri for any missed type ohs). So, shortcuts save you time and keystrokes. Tap the + in the upper-right corner. Type the phrase and the shortcut you want to trigger it. After you create a shortcut, just tap its name to change (edit) it. To insert a phrase, type its keyboard shortcut. Say the shortcut is Cty, which is one of the shortcuts shown in Figure 20-1. If you stop after you type y, the phrase appears in the middle of the QuickType suggestions. To insert the phrase, press Return or the space bar, type a punctuation mark after the y, or tap the QuickType suggestion; to ignore it, just continue typing. Here are three related tips about autocorrection that can also help you type faster and more accurately. Know that you can type dont to get to don’t, and cant to get to can’t. Put some faith in the iPad’s autocorrection software, including contractions. In other words, save time by letting the iPad’s intelligent keyboard insert the apostrophes on your behalf for these and other common words. There are at least two exceptions. The iPad can’t distinguish between it’s and its or can’t and cant. (It’s is a contraction of it is; its is a possessive adjective and possessive pronoun; can’t is a contraction of cannot; and cant is a noun or intransitive verb that means clichéd talk or jargon.) So if you need emails to be grammatically correct, remember that autocorrection doesn’t (or can’t or cant) get it (or it’s or its) right all the time. In a similar vein, if you ever need to type an apostrophe (for example, when you want to type it’s), you don’t need to visit the punctuation and numeric keyboard. Instead, press down on the exclamation mark/comma key until a blue apostrophe appears on the key, and then lift your finger. Presto — you’ve typed an apostrophe without switching to the punctuation and numeric keyboard and back. If the autocorrection suggestion isn’t the word you want, instead of ignoring it, reject it. Finish typing the word and then tap the x to reject the suggestion before you type another word. Doing so makes your iPad more likely to accept your word the next time you type it and less likely to make the same incorrect suggestion again. If you’re using a physical keyboard (for example, most Bluetooth wireless keyboards will work with your iPad), you can reject an autosuggestion by pressing the Esc key. Some people don’t care for autocorrect and turn it off. If you hate it too, here’s how to get rid of it: Tap Settings→General→Keyboard and tap the Auto-Correction switch to off (so that the switch is not green). Settings→General→Keyboard is also where you enable or disable other keyboard-related options, including Auto-Capitalization, Check Spelling, Enable Caps Lock, Predictive Typing, and the “double-tapping the space bar will insert a period followed by a space” shortcut. When your iPad is selected in iTunes, you see a colorful chart at the bottom of the screen that tells you how your media and other data use your iPad’s capacity. By default, the chart shows the amount of free space on your iPad, along with colored bands that represent the audio, video, photo, apps, documents, books, and such on your iPad. What you may not know is that when you hover your pointer over the chart, an overlay appears with the number of items of that type that are stored on your iPad, and how much space those items consume in megabytes (MB) or gigabytes (GB). Here’s the situation: You’re listening to a podcast or an audiobook and trying to find the beginning of a specific segment by moving the scrubber bar — the little red line representing the playhead — left and right. The only problem is that the scrubber bar isn’t precise, and your fat finger keeps moving it too far one way or the other. Never fear — your iPad has a wonderful (albeit somewhat hidden) fix. Just press your finger on the scrubber, but instead of sliding your finger to the left or right, slide it upward toward the top of the screen. As you slide upward, the scrubbing speed changes like magic, and the scrubber bar moves in finer and finer increments. The speed is displayed below the scrubber bar (the figure displays quarter-speed scrubbing). Slide your finger upward an inch or until you see High-Speed Scrubbing, which is about 75 percent of the normal scrubbing speed. Continue dragging upward in 1-inch increments or so and the speed changes to half-speed, quarter-speed, and very fine scrubbing. This scrub trick is easier to do than to explain, so give it a try. When the iPad encounters an email address (such as yourname@yourmailhost.com) or a URL (such as http://www.websitename.com) in an email message, it makes that text appear as a blue link on your screen. If you tap that link, the iPad launches Safari or Mail, and starts a new email message for an email address or takes you to the appropriate web page for a URL. So don’t bother with copy and paste if you don’t have to — tap those blue links, and the right thing will happen every time. Open in New Tab: Opens the page while stashing the current page in one of the nine available tabs. Add to Reading List: Adds the page to your reading list. 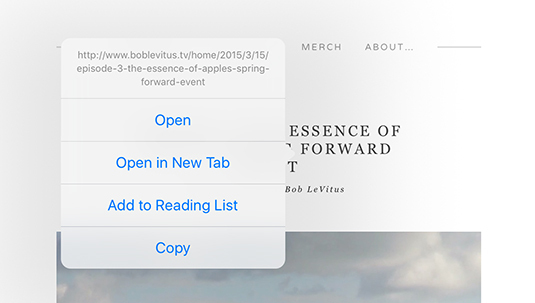 Copy: Copies the URL to the Clipboard (so that you can paste it in an email message, save it in Notes, or whatever). You see the underlying URL and open and copy options when you press and hold down on a URL in Mail as well. Having this information in Mail is even more useful because it enables you to spot bogus links without switching to Safari or visiting the URL. Here’s one more Safari trick: If you press and hold down on most images, a Save Image option appears. 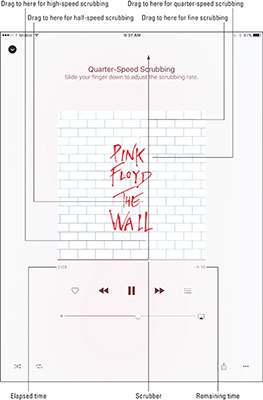 Tap Save Image, and the picture is saved to the camera roll on the Albums tab of the Photos app. Tap Copy, and the image is copied to the Clipboard so that you can paste it into an email message or document created in another app (such as Apple’s Pages or Keynote). Note that if the image is a link to another web page, you’ll see these options: Open, Open in New Tab, Add to Reading List, and Copy. Ever stumble onto a web page that you just have to share with a buddy? The iPad makes sharing dead simple. From the site in question, tap the share icon. Then tap the Message, Mail, Twitter, or Facebook option to share the link via email, share the link via iMessage, post it to your Twitter stream, or share it on Facebook, respectively, as shown in the following figure. 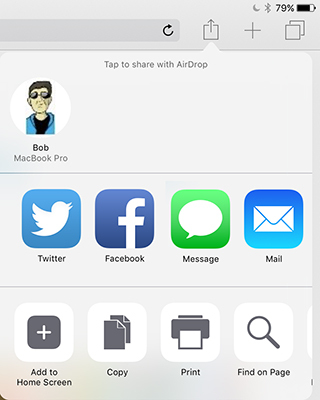 With iOS 8 or 9 and a fourth-generation iPad or later or iPad mini, you can also use AirDrop to share your link. Type a short message body (or don’t), supply your pal’s email or iMessage address if necessary, and then tap the Send or Post button. You may have noticed that the iPad version of Safari, unlike the Mac and PC versions of Safari (as well as every other common web browser), doesn’t have an option to specify a home page. Instead, when you tap the Safari icon, you return to the last site you visited. An icon that will open this page appears on your Home screen (or one of your Home screens if you have more than one). Tap the new web clip icon instead of the Safari icon. Safari opens to your home page instead of the last page you visited. You can even drag your home page icon to the dock, as shown in the following figure. Consider moving the Safari icon from the dock to one of your Home screens so that you never tap it by accident. Finally, remember that the dock has room for six icons, even though it has only four by default. 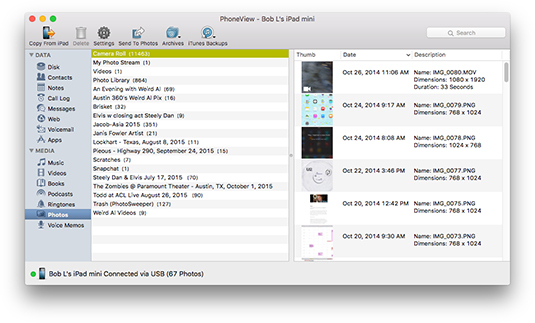 A tiny Massachusetts software company — Ecamm Network — sells a piece of OS X software, PhoneView ($29.95), which lets you copy files from your Mac to your iPad and copy files from the iPad to a Mac. (No Windows version is available.) Better still, you can try the program for a week before deciding whether you want to buy it. The big deal here is that while automatic backups protect most of the files on your iPad, you can’t manipulate them. They’re backed up and restored, but heaven help you if you want to extract one or more individual iMessages, specific songs, videos, notes, or other types of data from your iPad. The bottom line is that there’s no easier way than PhoneView. To transfer files and folders to the iPad: Assuming that you have room on the device, click the Copy to iPad button on the toolbar and then select the files you want to copy. The files are copied into the appropriate folder on the iPad. Alternatively, you can drag files and folders from the Mac desktop or a folder into the PhoneView browser. To go the other way and copy files from your iPad to your computer: Highlight the files or folders you want to be copied and then click the Copy from iPad button on the toolbar. Select the destination on your Mac where you want to store the files, and then click Save. You can also drag files and folders from the PhoneView file browser to the Mac desktop or folder. Or you can double-click a file in the PhoneView browser to download it to your Mac’s Documents folder. If you need access to the files on your iPad or if you want to use your iPad as a pseudo—hard drive, PhoneView is a bargain. Printopia, also from Ecamm ($19.95), can be used to print from an iPad to a non-AirPrint printer. It works great and costs a lot less than a new AirPrint-enabled printer. Many people have compared the iPad to an iPhone on steroids. Only the iPad isn’t actually a phone. But don’t let that stop you from making or even receiving phone calls on the tablet. You read right. You can make and even receive phone calls on your iPad. After all, two of the key components to calling are built into the iPad: a speaker and a microphone. If you have an iPhone 5 or newer and a 4th-generation iPad or newer, both running iOS 8 or later, you have everything you need. To make a phone call on your iPad, just tap a phone number in Contacts, Calendar, or Safari, or tap a recent contact in the multitasking screen. If you meet the requirements and still can’t make calls, go to Settings→FaceTime and turn on iPhone Cellular Calls. Conversely, if you hate this feature and want to disable it, go to Settings→FaceTime and turn off iPhone Cellular Calls. But wait! There’s more! You can make and receive calls even if your devices aren’t the latest and greatest. Just head to the App Store to fetch the third component: Instead of an iPhone, you’ll need an app that takes advantage of VOIP, or Voice over Internet Protocol. In plain-speak, that means turning the iPad into a giant iPhone. And yes, you can find more than one app to do the trick. Line2: Line2 costs $9.95 per month, and can receive calls through Wi-Fi or a cellular data network (if you have an iPad with 3G or 4G). It boasts such features as visual voicemail (like the iPhone) and conference calling. And it taps right into your iPad contacts list. Skype: Skype’s app permits free Skype-to-Skype calls, instant messages, and video chats; calls to regular phones around the world cost pennies per minute. Truphone: This app permits free Wi-Fi calls to Truphone and Google Talk users. Other rates are cheap. Press the sleep/wake button at the same time you press the Home button, but just for an instant. The iPad grabs a snapshot of whatever is on the screen. The picture lands in the camera roll of the Photos app. From there, you can synchronize it with your Mac or PC, along with all your other pictures, or email it to yourself or anyone else. And from there, the possibilities are endless. Why, your picture could wind up just about anywhere. You can also use an HDTV to show what’s happening on your iPad’s screen in real time. To see on an HDTV the content on your iPad’s screen, you need a television that has at least one HDMI port and either Apple’s Digital AV adapter for iPads ($39 for 30-pin connector; $49 for Lightning connector), or an Apple TV (from $69).